Reflections at the Kinderdijk Windmill Complex in The Netherlands. All content property of EuroTravelogue™. Unauthorized use is prohibited. When you think of Holland, what are the first impressions that come to mind? Windmills? Tulips? Clogs? Perhaps it's cheese? 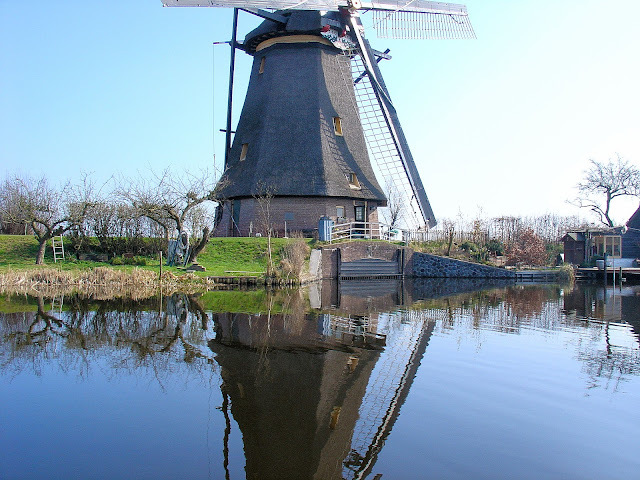 Personally, fanciful windmills and fields of vibrant tulips evoke Holland but all of that changed upon my voyage to the Netherlands with Viking River Cruises. While I saw plenty of windmills, I was not fortunate enough to see my tulips for alas, it was a wee bit early in the year. But what I did see changed forever my impressions of this picturesque country in northern Europe. From its inspiring pastoral countryside, to its charming seaside villages spilling with coastal charm, to its vibrant cities where futuristic architecture juxtaposes with classic Dutch designs—an aesthetic combination thoughtfully planned and pleasing to the eye, in most cases. And on one misty morning, the most magical yet; for I awoke to a horizon filled with whimsical windmills whose blades yielded ever so gently to the wind. One sublime moment after the next and I savored each one—pictorial souvenirs of my unforgettable impressions. I hope you enjoy my impressions of Holland as much as I do! Modern meets traditional Dutch architecture in Rotterdam, The Netherlands. Unilever wasn't permitted to tear down the traditional Dutch architecture so they built up and over it. It is my hope that by the end of this visual journey, you'll have a vast new collection to add your library so the next time you hear "Holland," your imagination runs wild! 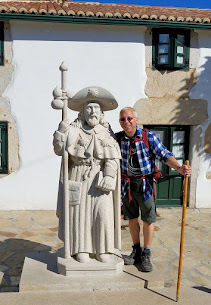 By the way, this post is also my contribution to the October edition of the European Carnival hosted by DJ Yabis at Dream Euro Trip—a collection of posts from fellow travel bloggers from all over the world. Capital city of the Netherlands, Amsterdam is world renowned for its enchanting canals, fabled architecture, inspiring artists, Anne Frank, and of course the infamous “Red Light District” and coffee houses. A canal tour rewards visitors with unencumbered views of this charming Dutch city, its historical past and vibrant present pulsing through its streets and waterways. 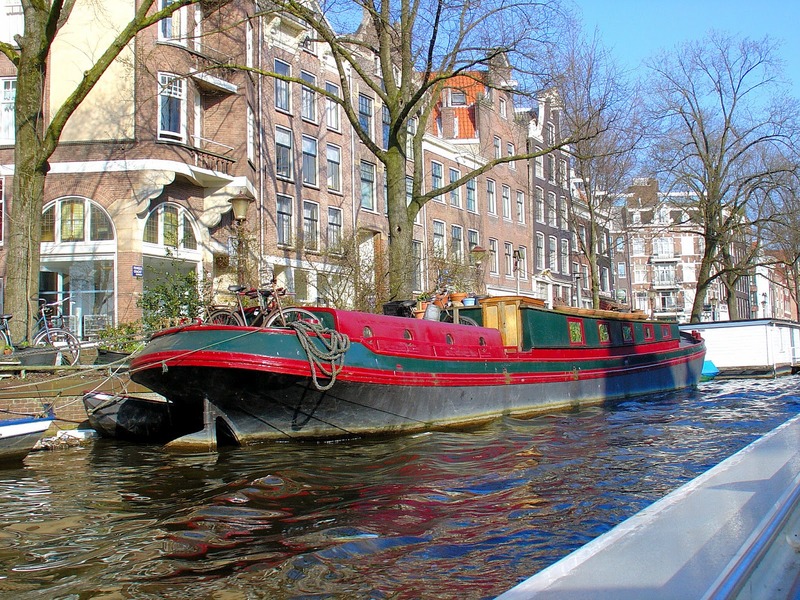 Picturesque house boats like this charming red Amsterdam home line most of the canals, and many of them feature gardens on the top decks! 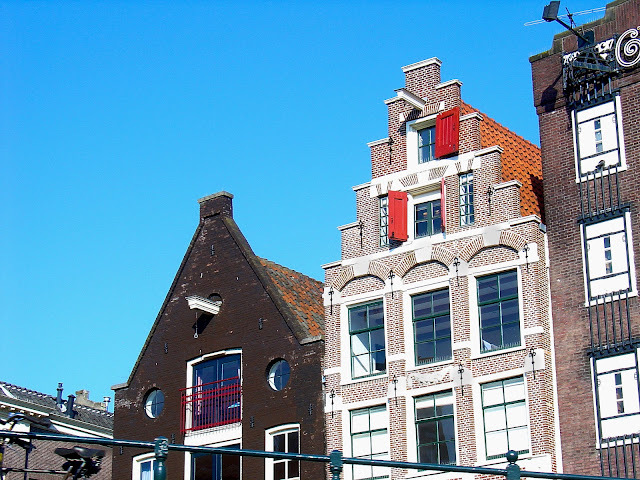 Quintessentially Dutch, these storied gables have become icons in their own right, from triangle and step gables pictured above to ornamental bell-neck gables with magnificent statuary. The picturesque Dutch countryside of Edam with its cobbled streets, storied architecture and canals spanned by centuries-old drawbridges—offer up idyllic settings that beckon to the artist armed with palette, brush and canvas, or perhaps a poet. A painting waiting for its canvas. Idyllic scenes like this presented themselves to me throughout my tour of Edam. 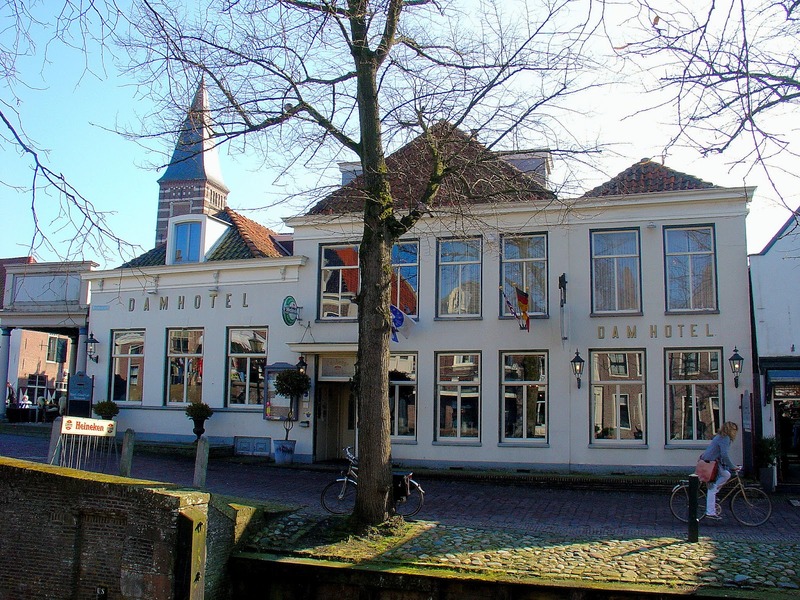 The Dam Hotel in Edam, The Netherlands. The charming town of Marken nestled on the shores of the Markermeer—a picturesque fishing village steeped in Dutch traditions with quaint architecture that perfectly preserves its time-honored past. For me, it was love at first sight of this littoral village by the sea. 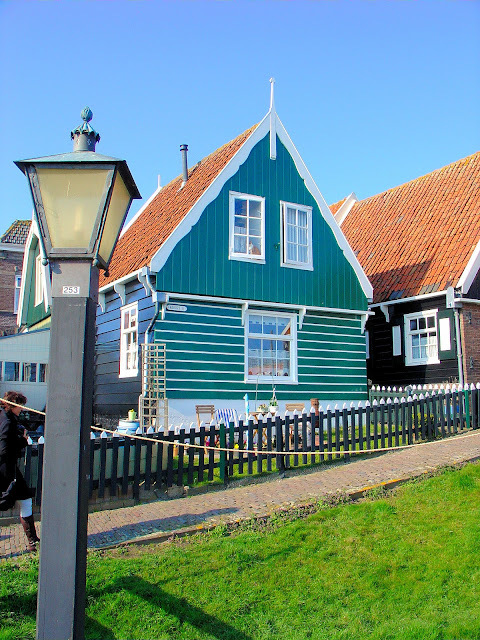 The seaside village architecture of Marken preserves its Dutch heritage dating back hundreds of years. The green and black clapboard siding decorates most of the shops and homes in Marken. 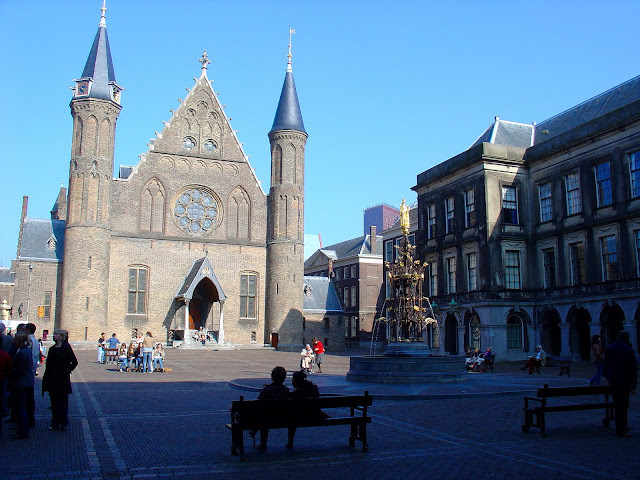 While Amsterdam is the capital city of the Netherlands, The Hague is the seat of Parliament and home to the government offices including the office of Queen Beatrix and the Prime Minister. The Netherlands' third largest city after Amsterdam and Rotterdam, The Hague also is home to one of my new all-time favorite museums—the Mauritshuis Royal Picture Gallery. 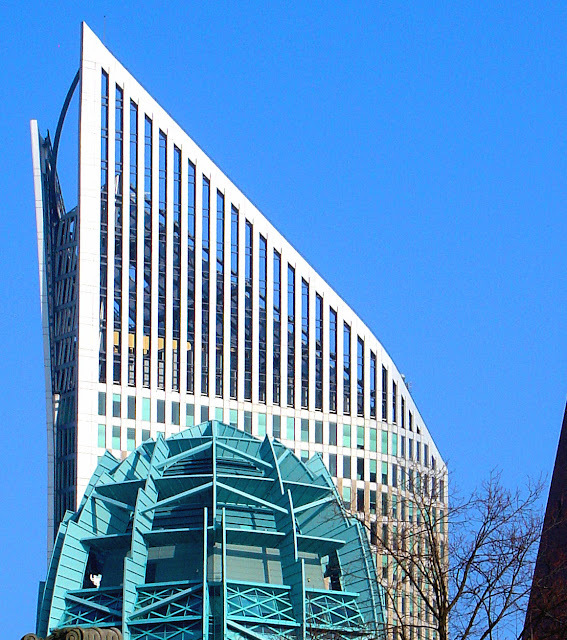 The skyline of The Hague is composed of strikingly modern architecture including the Hoftoren building in the background completed in 2003. Completed in the 13th century, the Knight's Hall or "Ridderzaal" is part of the Binnenhof Parliament buildings in The Hague. 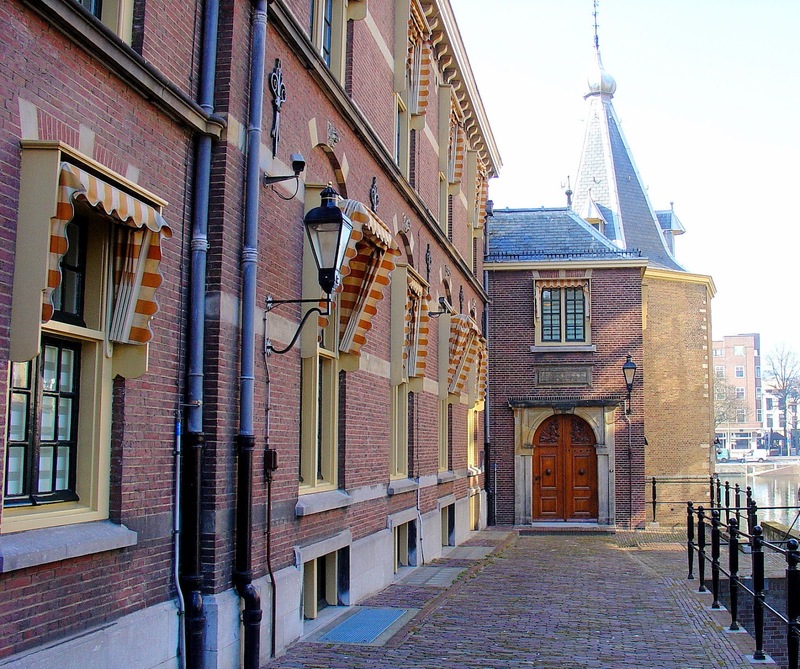 Among the multiple Parliament buildings in The Hague, this edifice is home to the office of the Prime Minister. 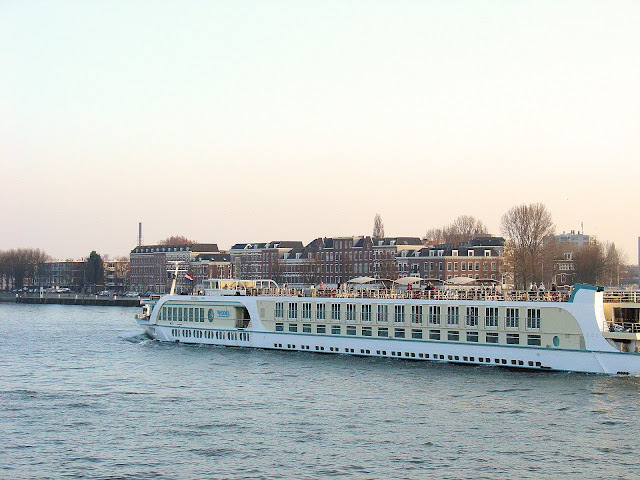 One of the many European River Cruise ships you'll see plying the waters throughout the Netherlands and all of Europe for that matter. 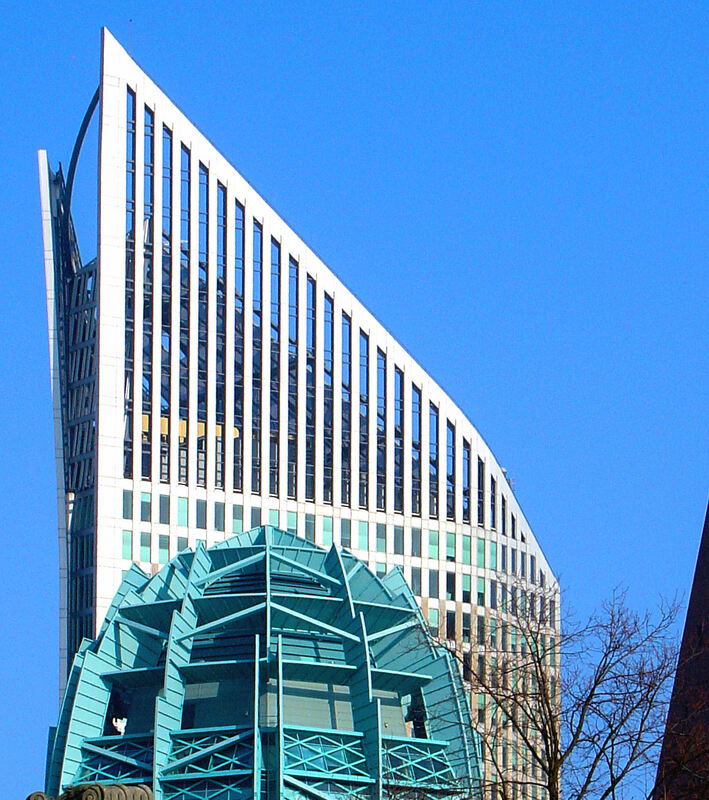 Modern times have transformed Rotterdam's skyline with stunning 21st-century architecture. A traditional Viking ship in the making is being erected in Rotterdam. Steeped in Dutch traditions dating back to the 17th century, Volendam continues to thrive today on its cheese and fishing industries which first put Volendam on the map so many centuries ago. The seaside village of Volendam is spilling with coastal charm. I couldn’t help but fall in love with the quaint architecture of this harbor town, its narrow streets lined with charming Dutch shops, and most of all the people! But what really charmed me and awakened a sleeping artist within was my visit to the Hotel Spaander. 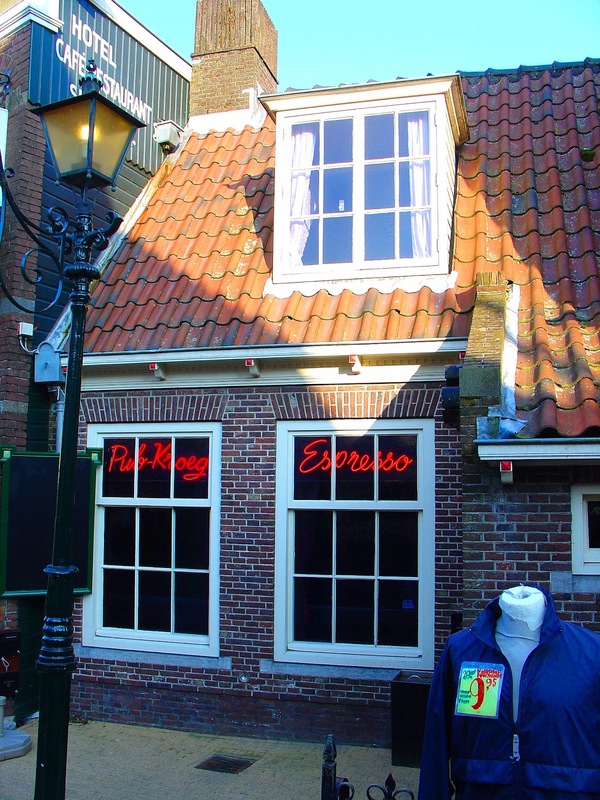 Its fabled past regales a time when this amiable cozy inn was a major draw for artists visiting the Netherlands who exchanged their etchings, sketches and paintings, many of which remain today, for room and board. And yes, Van Gogh was among the frequent guests however, you won't find his work here any longer. 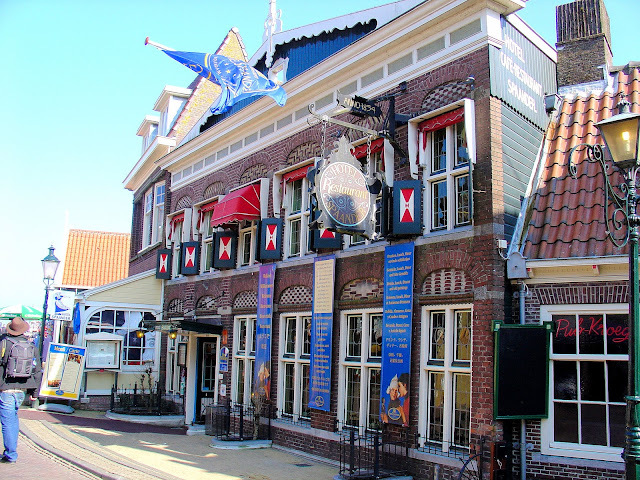 The Hotel Spandaar in Volendam continues to draw visitors and artists to this day. 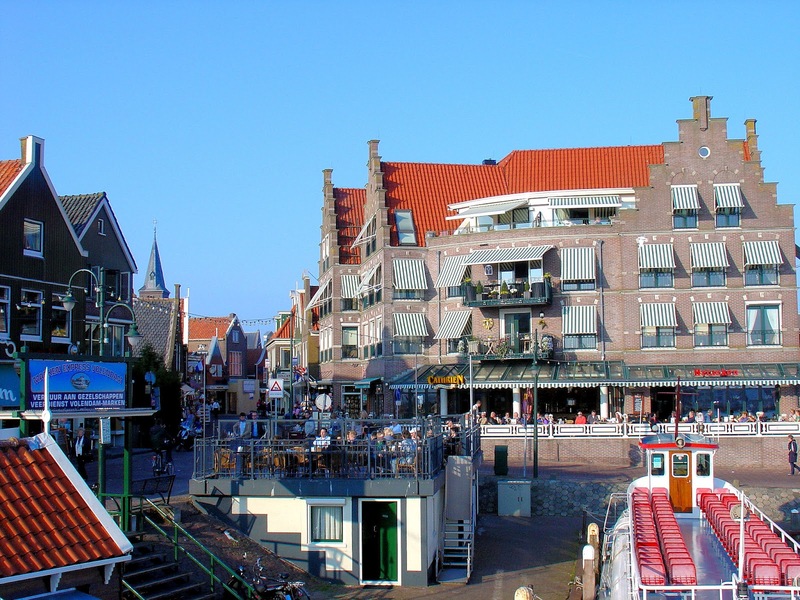 Volendam's quaint streets and drawbridges lure you into the central village for a stroll along its cobbled streets. The charming Kroeg or pub in the village of Volendam. And so I will leave you with this tasty morsel of many of the delectable delights, edible and visual, I had the pleasure of indulging throughout my journey of Holland. I hope you enjoyed this postcard journey through the Netherlands! 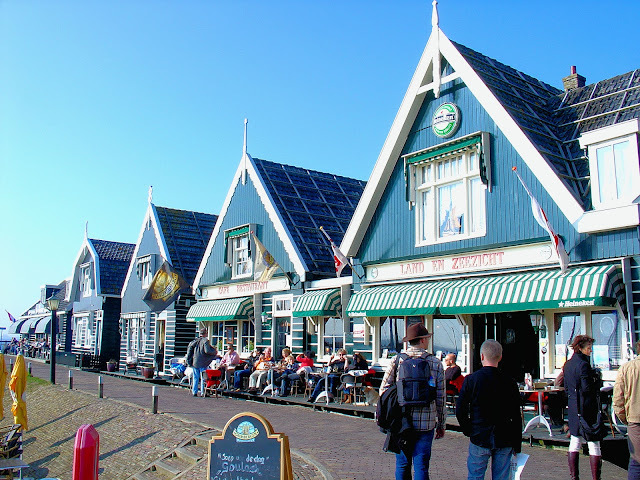 Before our "Viking Odin" was scheduled to sail away, we toured the town of Volendam for some lasting impressions and to our surprise, quite tasty impressions at that! Don't these pictures just make you want to be there? Hi there Marlys!! 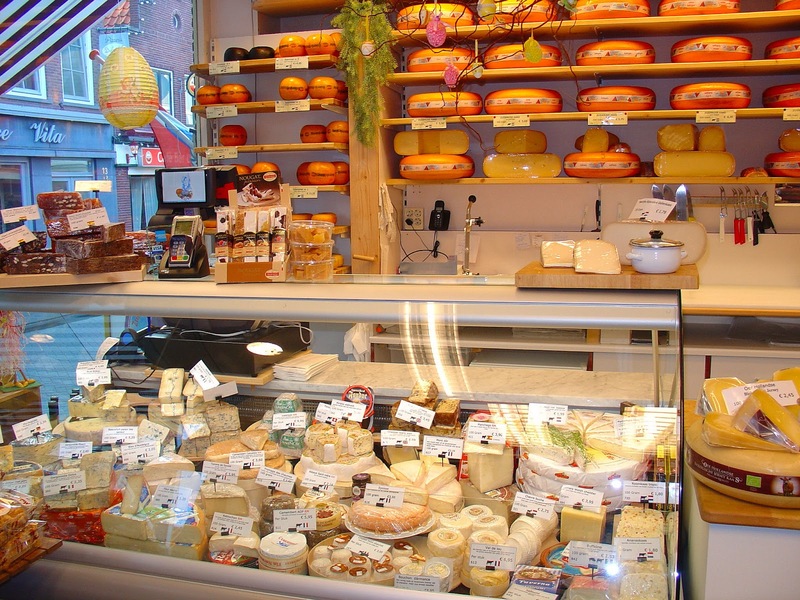 Oh yes, especially in that cheese shop! Thx so much for stopping by and sharing your thoughts! I love this. And what nice weather you had! It was cloudy/overcast almost the whole time I was in the Netherlands, which doesn't make for great photos. I especially enjoyed seeing your shots of modern architecture. Hi Jenna and thank you so much for visiting and for your kind words. I too loved the modern architecture and almost took a tour on our last afternoon to seek out all of the modern architecture in Rotterdam. Instead, went to The Hague and the Mauritshuis Museum...just had to see Vermeer if you know what I mean ; ) . One of the things I love about the Netherlands is all the different styles of architecture you can see, the contemporary right next to the medieval. 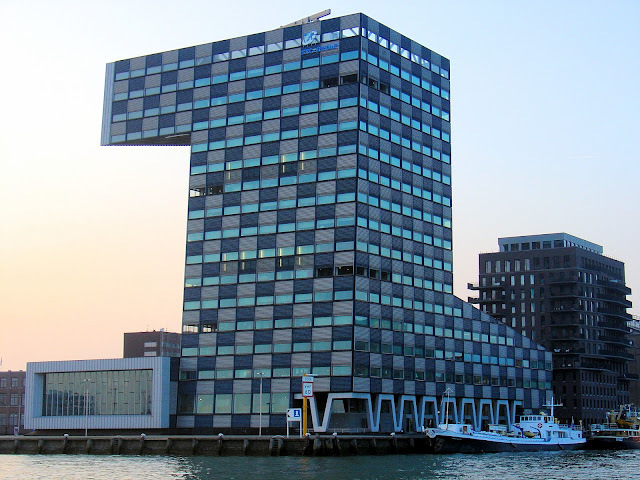 I've never been to Rotterdam, but after the taste you give of it here, I want to. Hi there Margaret and thanks so much for stopping by! 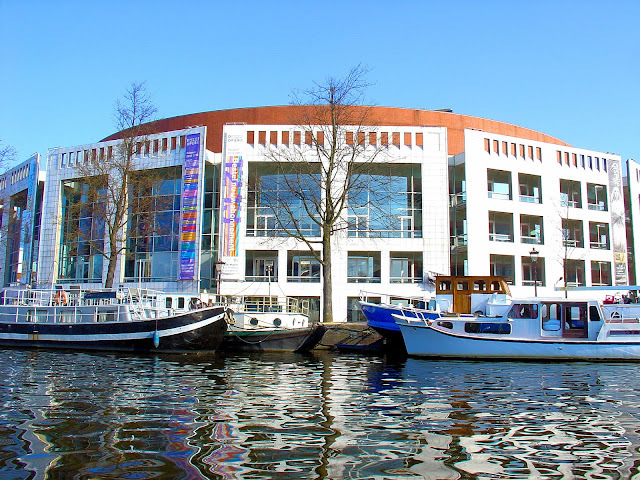 I couldn't agree with you more..love the diverisity in the architecture throughout the Netherlands. Quite stunning! Terrific photos, Jeff! Love all those watery reflections. The Dutch are really tops at integrating new architecture with the old; your photos illustrate that very well. Hi there Lesley and thank you so much for stopping by and more importantly, your kind words. The canal shots are awesome! We were in Amsterdam in February and was freezing. Need to go back in summer I think. Hi there Cole and thanks so much for stopping by to share your experiences! I was there at the end of March and while it was cold to this Floridian, it was unseasonably warm in the Netherlands for our entire stay! You must get back to enjoy during warmer climes! Thx again! Hi Jeff. I've been to Netherlands several times but not outside of Amsterdam. I enjoyed touring the rest of the country through your wonderful photos. I hope to return sometime soon and explore more. HI there Marisol and thanks so much for stopping by! 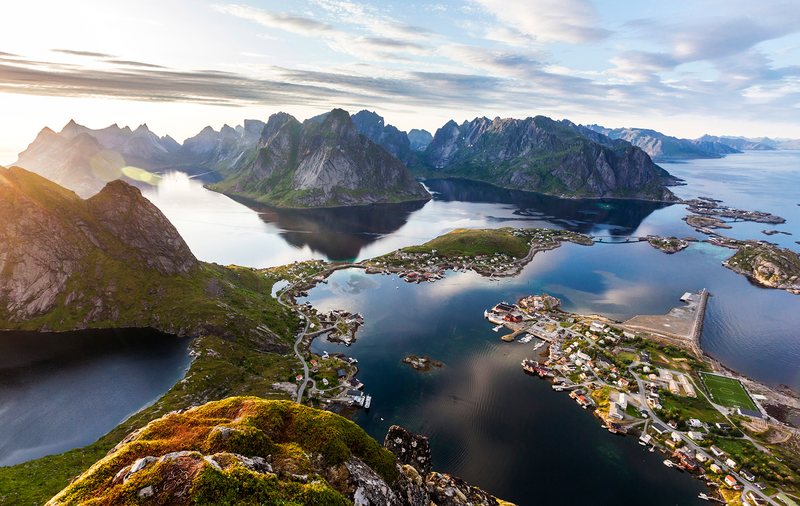 You really must get out and see the rest of this most picturesque country...sublime landscapes await you on your next journey! Thank you for your kind words! 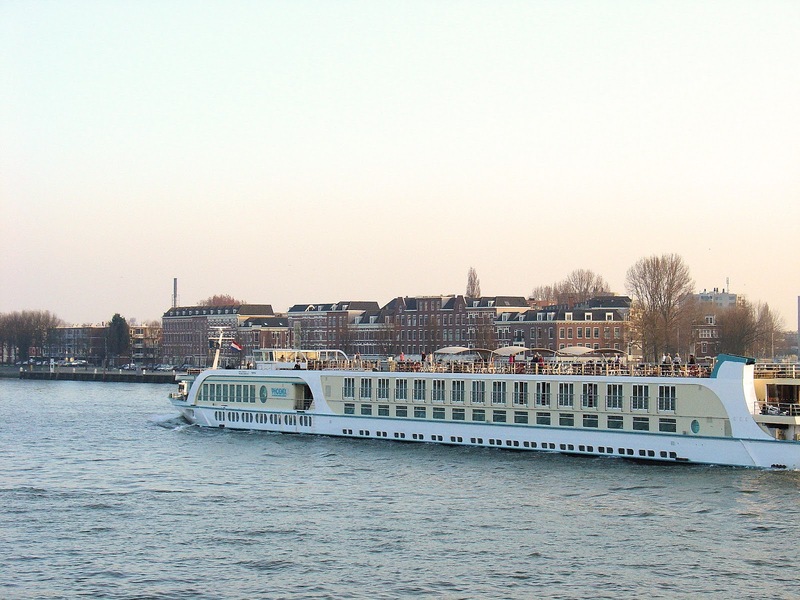 A river cruise looks like the perfect way to explore the Netherlands! I still haven't been yet, but will be going next month. Your photos make me very excited! Hi there Laurel and thanks so much for stopping by! Wow, you're going on a river cruise...I for one can tell you that you are going to LOVE EVERY MINUTE of it! Look forward to all of your updates and living vicariouly throughout your journey! Have a most wonderful time my friend. Hi Lorenzo and thx so much for stopping by!! You and me both!! I would even try, a year or two. It must be such a romantic lifestyle! Thx so much for sharing your thoughts! Hi there Aleah and thank you so much for your kind words. I agree, so many of the landscapes I encountered in Edam were paintings in the making! I loved how picturesque this little village was! Sublime actually. Thx so much for stopping by to share your thoughts! Super photos Jeff! I've never been to Holland but these pictures have made it come alive. Someday I'll get there to see all this for myself. Thank you so much Frau Debbie for your kind words! Hope you do make it to Holland, you'll fall in love like I did! Thx for stopping by to share your thoughts! Hi there Pollyana and thanks so much for your kind words and for stopping by! Love the contrast of modern and traditional architecture! Hi there Leslie. Right you are my friend... throughout Holland such juxtapositions can be found around every corner...and so tastefully integrated to boot! Thx so much for stopping by my friend! Great photos! 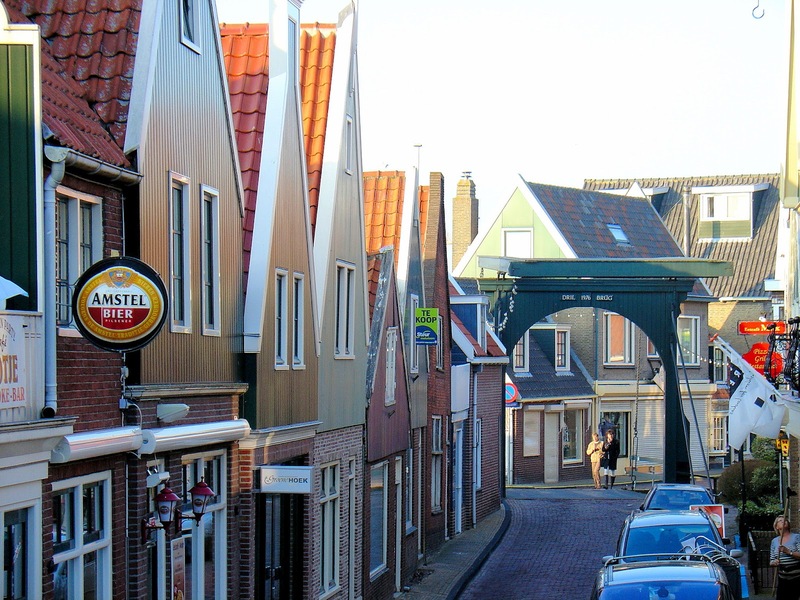 I go to the NL every year to visit the in-laws and now want to visit Marken! 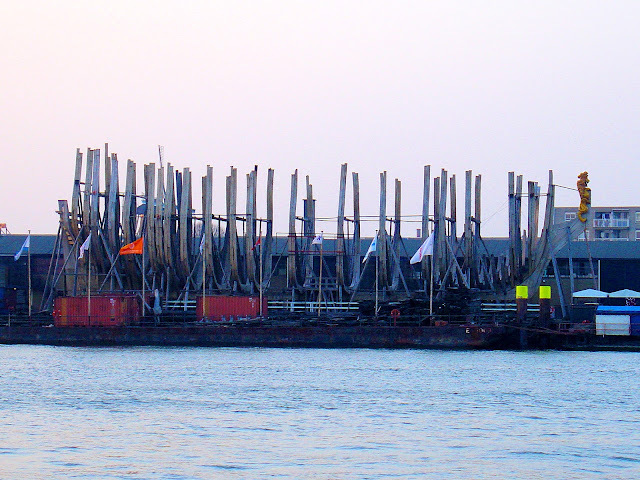 Thanks for portraying the NL (esp Rotterdam as it was rubble for years) in such great pictures! Hi there and thx so much for the wonderful comments! I hope you saw my post on Marken too! I just love NL!! Thank you for stopping by to share your thoughts! Hi there Pola! Thank you so much for your kind words and sharing your thoughts. I echo your sentiment about staying in Damhotel, besides being so charming, I too could see myself staying there! Thx for stopping by! Beautiful - simply amazing. Great countryside, wonderful images! Well done Jeff! Wanna go back? Hi there my friend and thx so much for stopping by and sharing your comments! Thank you for your kind words as well. I am so ready to move there, that's how much I want to go back! Holland is sublime! Superb captures! Buildings looks quaint yet awesome. Hi there Nikhil and thx so much for stopping by and for your kind compliments! I fell in love with Holland and want to see so much more! 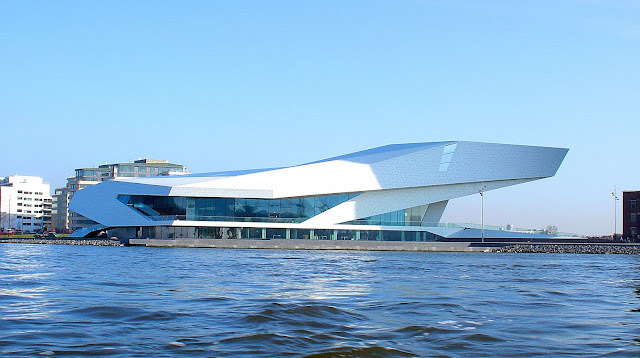 The Dutch Film Museum is quite a demo of the new architecture. 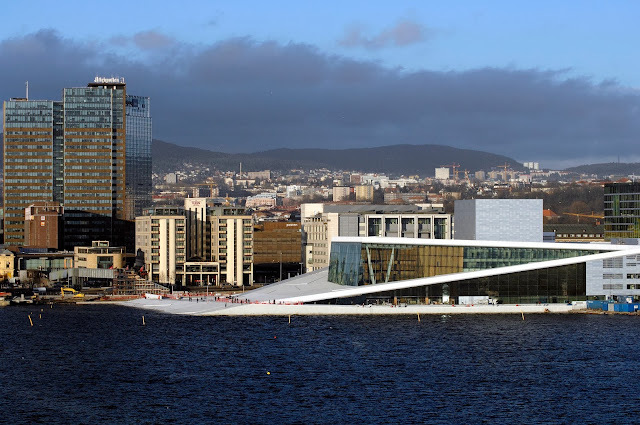 It would be interesting to show photos of that, the Oslo, Norway, Opera House, and the Copenhagen,Denmark, Opera House together. All similar: silver, polygon shapes, seemingly floating on land, and a cold look for cold climates. Hi Tim and thank you so much for stopping by! I would be happy to put together a post like that...just as soon as I visit those other places. ; ) But I do see your point, it would be interesting to see all of them presented together. Thank you again. Did I miss a photo of the Erasmus Bridge in Rotterdam? Quite a spectacular look in an album of Dutch architectures. Hi there Tim! Wow, two comments from you! I am indeed honored! 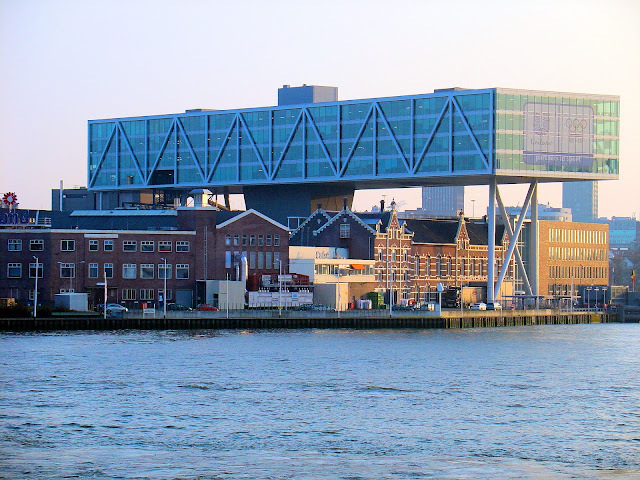 I didn't have many pics of Rotterdam because that day, I left on excursion to The Hague to see the city and the Mauritshuis Royal Picture Gallery!! SUBLIME! Two compliments: Having visited the capitals of Western Europe I now enjoy seeing the sights of towns and villages (e.g. Volendam, Edam, and Mark) via your website. And the photography is always terrific. Thank you so much my friend again for stopping by and for your kind compliments. You must venture to the charming Dutch countryside! I LOVED EVERY MINUTE!! Thank you Charu but all credit goes to Holland! The country is a Kodak moment everywhere you look. Thanks for stopping by and for your kind compliments too! The photos are really good. I especially like the variety of architecture. They make you want to visit. Thank you so much Kristin, I really appreciate your kind compliments! I really LOVED my time in Holland and can't wait to return one day SOON! Thanks for stopping by and sharing your thoughts!